Teams often leverage the discussion feature, in particular the ability to @mention team members, in VSTS for work items to collaborate on requirements, tasks and bugs. In large teams it is common to @mention several team members on messages to ensure that the relevant people are involved in the discussion. VSTS however currently does not have a “Reply all” feature, which means you have to manually @mention each member in the previous message when replying to a discussion post. I have developed a simple Chrome extension, VSTS Quick Reply, to help with this. 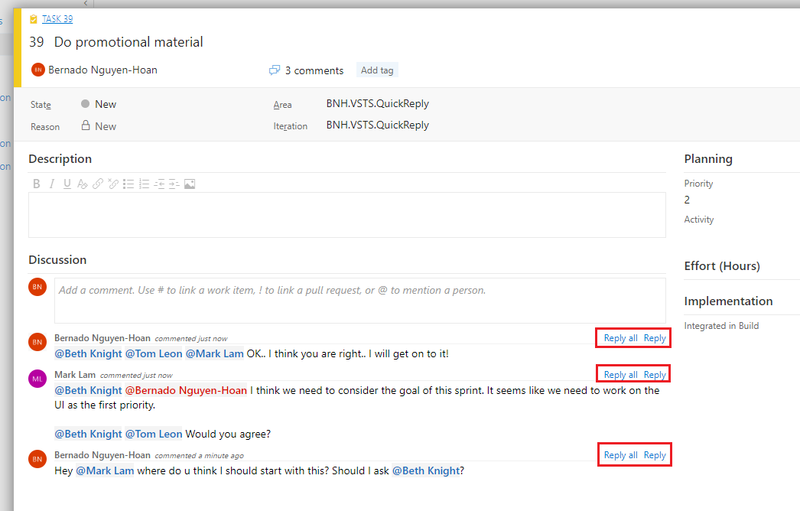 This simple extension adds a Reply and Reply All links to each discussion message that have been posted against the current work item. When clicked, these links add all the @mentioned users and/or the original poster of the selected message to your new message entry textbox so that you don’t have to manually type them again. Currently this extension only supports VSTS. You can install this extension from the Chrome Web Store. That’s it! I hope this simple extension can give you a small productivity boost when collaborating in VSTS. I would love to hear from you with feedback and suggestions! This entry was posted in TFS, VSTS. Bookmark the permalink. This is a really useful extension but I noticed it does no work with the new navigation preview feature enabled. Are you planning to support this? Hey there, thanks for the feedback. I was not aware that it does not work with the preview feature. Thanks for letting me know. I will look into it :). Thanks for your reply. It is now working – I think perhaps it was a refresh issue or something. I did try refreshing and reopening Chrome at the time with no luck, but now it seems to be happy. Ok, a bit more info.. it seems to work fine if I open the work item in it’s own tab but if it is opened in a pop-up then it doesn’t work. Sorry I missed your last comment. I will have a look into this.